When a handshake or a simple "thanks" will not do, consider this frame as an appreciation gift. 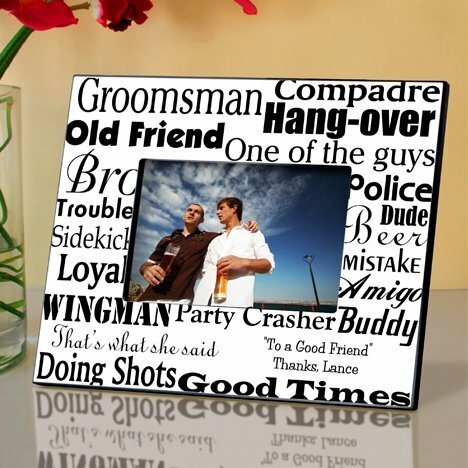 Show your groomsmen how much they mean to you with this Personalized Groomsman Frame. 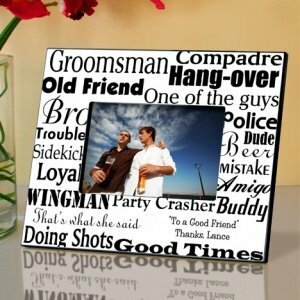 This black and white frame has words and phrases that may help recall many of the escapades you and your friends shared. Each graphic frame measures 8" by 10", has room for a 4" by 6" photo, and can be personalized with 2 lines with up to 20 characters per line.